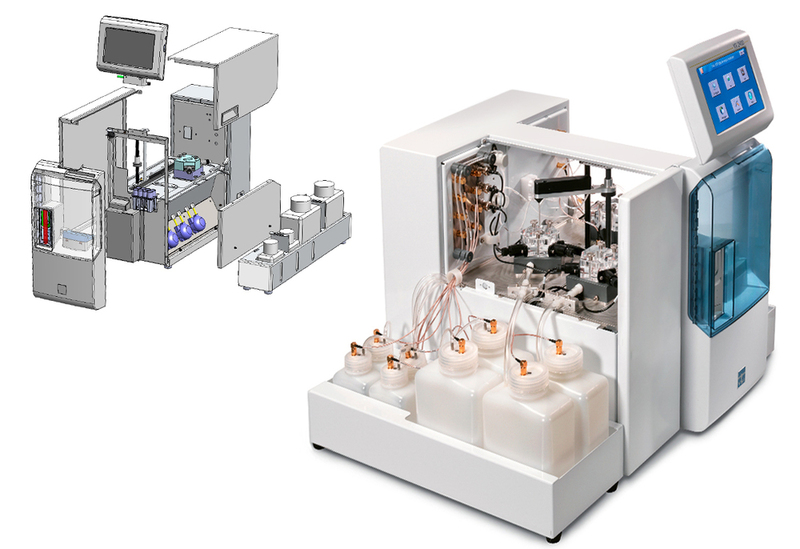 YSI 2900 Biochemistry Analyzer — Brownlie Design, Inc. The development of the 2900 began as a simple facelift for the 2700, which was a staple in laboratories around the world. It soon became apparent that additional automation was required to more fully meet user needs. With most laboratories, space is at a premium, therefore it was important to minimize unit width without compromising accessibility. To run a variety of processes, users are required to swap sensors frequently but replace tubing less often. By having a split removable side panel, sensor changes could be made without exposing internal tubing. The instrument also needed the ability to quickly process single samples from a variety of vessels, many of which were new to the industry. Brownlie Design developed a unique external clamp that could be activated with one hand while allowing technicians to accurately place even the smallest vials. Brownlie Design worked closely with YSI’s engineering team to assure the structure was solid for critical mechanical alignments while retaining the narrow profile and easy access.